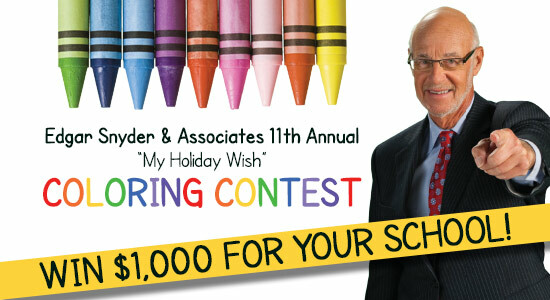 Elementary school students across Western Pennsylvania have the chance to earn cash for their school and themselves in the Edgar Snyder & Associates® "My Holiday Wish" Coloring Contest. As the contest enters its 11th year, the law firm is upping the ante, pledging to give a $1,000 donation all four winning students' schools this year. In addition, the grand prize winner will receive a $250 Visa gift card, and their artwork will appear on the front of the law firm's 2014 holiday card. Three runners-up will each receive a $100 Visa gift card and will have their artwork featured on the back of the card. An outside panel of judges will review and select the winning illustrations. Adelle Schott of McKnight Elementary School received last year's grand prize for her drawing of a musical snow globe surrounded by the words "let there be peace on earth, and let it begin with me." The "My Holiday Wish" Coloring Contest is open to any elementary school student in Western Pennsylvania. Entries must be post-marked on or before October 27, 2014 to be eligible. For additional details and official contest rules, visit edgarsnyder.com/color.